Here’s another story from the dust covered archives, this time about Don Chapman, who was already a veteran commercial filmmaker when I did this Midlands Business Journal profile of him in 1990. He came out of the ranks of early television photojournalism to launch his own commercial production house and when I caught up with him he had already made the transition from film to video and analog to digital technology, in what was still very much a transitional time in his industry, and how he talks about one versus the other is quite interesting given how ubiquitious the video-digital platform is today. He clearly saw it as the new standard for his field and wasn’t fighting this new format, though he did express some regret about losing the romance of working in film. He covered some big stories as a newsman and once made news himself when he was detained in Cuba during the height of the Cold War. Most of his career was much more prosaic than that, but he had his share of adventures and he established himself as a journeyman imagemaker for large corporations. Don Chapman has lived by that intrepid code since the U.S. Navy made a photographer out of him during his 1953-56 tour of duty. The owner and president of Chapman & Associates, an Omaha film, video, slide and multimedia production company, paid his professional dues as a WOW-TV photojournalist in the late ’50s. He followed news trails throughout the Midwest, learning to tell compelling stories through pictures. The reporter became a newsmaker when, as a freelancer, a case of bad timing led to his becoming a political prisoner of a hostile Latin American government. Since 1961 he’s applied his newshound instiincts, storytelling knack and adventuresome spirit to commercial photography and film production, which have taken him to Mexico, Spain and other parts of the world. After a 20-year partnership with former WOW-TV colleague Robert Spittler, Champman formed his own production house in 1981. Chapman & Associates serves a national, mostly industrial client base. Video editing, optical and computer graphics design, slide processing and sound recording facilities are located at Chapman’s two-story location at 1912 California Street,. The site contains 10,000 spuare feet of office and studio space. About 90 percent of the firm’s photography is shot on location, including some pretty far-flung places. Chapman handles a large share of field assignments himself. Now in his 30th year as a film producer, the veteran photographer has traveled many varied roads in pursuit of images. In that period he’s seen video technology change the face of his industry, which like everything else in America is now computerized and online with our insatiable appetite for instant gratification. Serial killer Long before Nike made it fashionable, Chapman exemplified the “just do it” work ethic. He honed this work ethnic and storytelling ability while earning his color bars at WOW-TV, whose parent Meredith Publishing Corporation also owned WOW Radio. Because the stations shared a combined news operation, reporters like Chapman filed stories for both. Since TV was still in its infancy Chapman shot black and white still photos and motion picture film for later broadcast. The days of videotape and live feeds were far removed yet. “We did our own motion picture processing and used the original 16 millimeter footage on the air,” he explained. “Many times we left stills in the hypo just long enough to let them fix, then pasted them against a board in front of a camera while they were still wet – just making the (live) news broadcast. Together, they covered the Charles Starkweather murder spree and trial, Soviet premier Nikita Khrushchev‘s visit to an Iowa farmhoouse during his celebrated U.S. tour and John F. Kennedy’s presidential campaign. 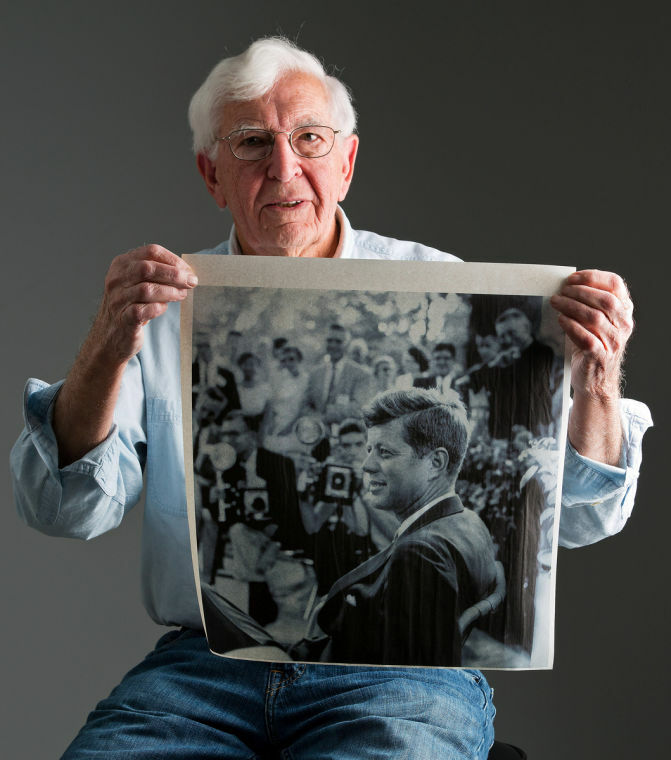 At a Kennedy campaign stop Chapman was indelibly linked with the future president when a French photographer snapped a picture of the candidate against a backdrop of paparazzi. 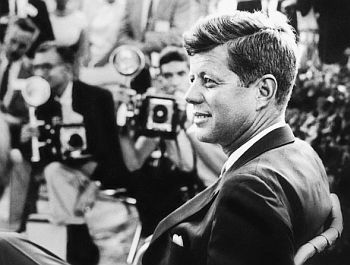 Cropped for use on a campaign poster, the picture prominently featured Chapman poised with his camera behind the famous JFK profile. The picture’s been published countless times. August 1959: Senator John F. Kennedy during session with the press in Omaha, Nebraska. ©Photo, Jacques Lowe. The unexpected is the companion of any photographer. It took a dangerous turn for Chapman in 1959 when, after a photo tour of Europe, he was returning home on a Liberian freighter. During an unscheduled stop at Havana, Cuba to unload cargo, an explosion rocked the ship. Soldiers rounded up suspected saboteurs. Chapman was arrested. Communist Cuba, still aflame with revolutionary fervor, was testing its new found status in the Cold War in terms of how far it could push the United States and its allies. He had the double misfortune of being the only American aboard and carrying expensive camera equipment, which was confiscated. “Here I was in the middle of a great story, and no camera,” he said. 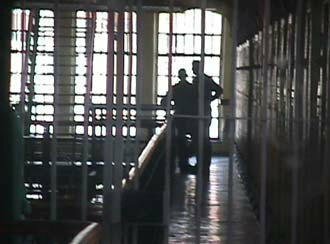 “I was held incommunicado and interrogated many times. One of his interregators was Cuban dictator Fidel Castro himself, who not long before had led his revolutionary guerrilla forces in deposing the U.S.-backed Batista regime. While that close scrape stands out, physical danger is a professional hazard he’s encountered his share of times. On an aerial shoot in the mountains near Santa Barbara, Calif., Chapman was strapped in a helicopter mount. As the chopper skirted over the 5,000 to 6,000 foot peaks, he filmed panoramic scenes from his exposed perch. It was a position he’d been in many times before. Some Champman clients have operations in remote places, where the terrain is less than hospitable. An example is Union Pacific Railroad, which hired Chapman to photograph a 10-minute film, The Rivers of Steel, for exhibition at the 1984 New Orleans World’s Fair, The job took Chapman and cinematographer Roger Mazur all over the U.S., including the mountains above Salt Lake City, Utah, where they went in search of snow scenes. Not all jobs are rugged or dramatic. In fact, much exterior location work involves setting up equipment, followed by long periods of inactitivty waiting for the precise light that only Mother Nature can provide. “I’ve sat for hours in some pretty bad environments waiting for the right moement,” Chapman said. Having waited out more than his share of sunrises and sunsets on motion picture shoots, Champman said clients could afford a wait-and-see approach in the past. 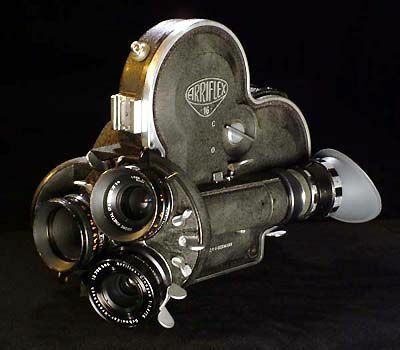 Chapman said the very fact that raw video footage can be viewed on a monitor in the field or back at the studio the same day has robbed photographers of the independence and mystique they enjoyed in the film era, when exposed celluloid had to be shipped off to be processed. Photographers were vagabond kings with highly specialized skills: few people could operate a 16 or 35 millimeter motion picture camera. The filmmaking process was regarded as equal parts craft, intuition and pluck and its practicioners were alchemists with film and camera. Roger Mazur agrees. “We also had a thing called reliability. You had a camera that 99 percent of the time was going to work. In video you have a camera, a recorder and all these electronic components that can just go out. I cannot leave a location now without checking the tape because there could be a drop-out or glitch,” he explained. Yesterday’s trust has been replaced by accountability. “Nowadays,” Chapman said, “clients look at everything immediately.” With VCRs and camcorders as commonplace as microwave ovens, he said, everyone believes they’re an expert. About a year ago Chapman & Associates had a video post-production facility installed on site, including a DVE or digital video effects system that can create computer generated graphics. The editing facility capped a remodeling and expansion project by the firm. Chapman describes the facility as a “boutique edit suite that has all the bells and whistles we can use in industrial production.” Before adding its own editing capabilities the firm used facilities at Editech, a local postproduction house. Chapman uses digital Betacam tape and equipment. “Digital technology has taken over every large market area. On digital tape there’s no degradation of quality. You can run a tape thousands of times and it’s still first generation,” he said. He said his company does a large amount of work for agricultural clients but does not concentrate in that area as it once did. Its clients today are a diverse group, including hospitals, community service organizations and trade associations. The majority are corporate and industrial giants such as BASF, Dow Chemical, Con Agra, Union Pacific Railroad and Mutual of Omaha. Although some of Chapman’s work airs on broadcast television, most is seen by a closed-loop audience of industria/corporatel clients and their customers and employees. “Multi-image slide shows for national sales meetings are probably the most challenging jobs because you can’t make a mistake. It’s a one-time only performance and everything has to flow. It’s live,” he said. Chapman’s produced such shows using up to 40 projectors at once. He added that the trend is moving away from multi-image slide shows to video because of the cost factor. “As far as the most gratifying project we’ve done, it had to be Rivers of Steel because people clapped,” he said, referring to the Union Pacific film shown at the ’84 World’s Fair. He believes that film has probably had the largest viewing audience of anything he’s produced. Chapman said the video boom that has flattened out the U.S. motion picture industry is a worldwide phenomenon. He keeps abreast of international trends through his participation in I.Q., the International Quorum of Film Producers. Hungary was the setting for last year’s I.Q. meeting, giving Chapman a glimpse of Eastern Bloc technology. He said the state prodcution facilities he visited were out-of-date by Western standards. He said the edit suite he visited was extremely hot because such basic enviornmental controls as ventilation and air conditioning were absent. Hungarian officials told him funding shortages are an endemic problem, stalling the installation and updgrading of needed equipment. Officials also acknowledged the impact video is having in Europe. I.Q. provides a network of information and resources for member producers who share their stock of images with peers. If Chapman receives a request for agricultural or farm scenes he can access his computerized files of more than 50,000 slides and miles of videotape to find images that match the request. He can fax or mail materials as needed. Likewise, he said foreign producers provide him materials and help cut through the red tape of shooting abroad. He said some of the footage has been transfered to videotape but the vast majority of it remains on film.